When they flew Casey into the hospital at Nha Trang, the medics were sure he’d die. That he didn’t was only the first surprise. The second, bigger one, was that Casey had been fighting for two thousand years, ever since that day on Golgotha when he put his lance into the side of the Man on the Cross. So does Casca’s journey begin, a man who cannot die, does not age, and knows no skill but those of battle. He becomes The Eternal Mercenary. There’s a lot to talk about in today’s review, and before any of that I want to thank Hannah, who brought this series of books to my attention. She deserves special thanks because these books are the epitome of what this blog is all about. I got the ebook version of this novel and read it on my Kindle. The entire series, minus a few volumes that have been purged from the canon, is available this way. If you use Kindle Unlimited you can even read them that way. I don’t subscribe to that service, so I didn’t have that option. Nevertheless, I was excited enough by the entire premise of this novel that I forked up the ten bucks. I don’t regret it. The cover image presented up there is not the cover image for the Kindle edition. The ebook version is similar, but worse and I couldn’t find a decent-rez version of it. Because it was an ebook it didn’t have a back jacket, obviously, so I copied what appears to be the jacket copy for the original edition from Goodreads. If anybody happens to know that this is in fact not the correct jacket copy, please let me know and I will correct. WordPress has this new post editor, and I like it, but it might mean that the usual format of my blog posts is altered a bit while I figure out how to duplicate the original one. On the flip side, I’m taking it as an opportunity to goof around a bit. Yep, it’s the same guy! “The Ballad of the Green Berets” was a hit in 1966—one of the very few pro-military hits of that era—and then by 1979 Sadler had decided to write a series of books. In between he released some other music but none of it reached the same level as “The Ballad of the Green Berets.” He also appeared on TV a few times. He also killed a man by shooting him in the head, after which he tried to plant a gun in the guy’s vehicle. It was ruled voluntary manslaughter and Sadler served about a month in the county workhouse. The guy had been harassing Sadler and his ladyfriend, with whom he had been previously involved. Between this incident and the end of his life in 1989 after a mysterious gunshot to his own head, a subsequent coma, and a series of fierce court battles, Sadler had a tragic life, but he also did some good in the world by providing free medical services to remote villages in Guatemala (Sadler was a medic in the Green Berets himself). Tragedy aside, Sadler’s military experience makes this series of books a bit more complex and fascinating. I’ll get to the details in a minute, but long story short, these books are 70s pulp man-fantasy, and they’re about war. Lots of the man-fantasy series I’ve read have characters that served in the military (usually Vietnam) and have brought those skills back to civilian life to be vigilantes, and there’s always that strict pro-military bent to the genre. 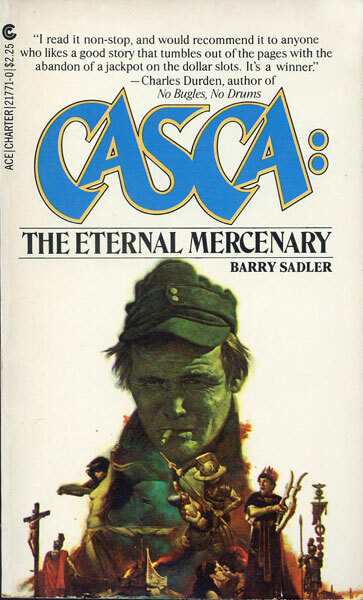 Casca, though, is the only one of these—that I know of—written by someone with real first-hand experience of war. The premise of this series is the absolute best. It’s like they were written just for me. Our main character is Casca Rufio Longinus. He is the soldier that, according to John 19:34, stabbed Jesus in the side with his spear as he was suspended from the cross. In real life there are legends about just such a figure, who is sometimes conflated with the Wandering Jew legend. Casca is rendered immortal as punishment. Specifically, he is condemned to wander the Earth as a soldier until Jesus comes back. The book does not explore the theological implications of this. So what we get is a series of books featuring Casca’s involvement in all of human history, although I presume mainly the parts that are war. But I repeat myself. Looking at the series beyond #1, it looks like Casca gets into some wacky adventures. Hell, by #2 he’s in Mexico in the 3rd century and I’m sure it’s very tasteful. I’m seeing summaries for books where he’s at Agincourt, hanging with the Khans, and fighting for the Confederacy. Sadler wrote the first twenty-two novels in the series. After he died, the series was picked up by several authors and apparently there’s some scandal regarding all that. Two of the books were plagiarized from other sources and dropped from canon! The series is currently being written by Tony Roberts. He just put out #49: The Lombard. This book is wild and crazy, kids. It’s clear that it was written as a setup to the rest of the series, so the wartime action isn’t as prominent as I’m sure it gets later. I might be wrong! I look forward to finding out. There was still plenty of war, though. It starts out in Vietnam in 1970. Specifically it starts at a Field Hospital in Nha Trang. It’s here that we meet Dr. Julius Goldman, a doctor. He’s busy patching people up after a particularly gruesome ambush when he comes across a soldier identified as Casey Romain. The soldier ought to be dead. He was hit by a mortar and his head is all but destroyed. Brain is exposed. Yet he remains alive. As the doctor watches, the wound starts to stitch together. Further investigation reveals a spearhead embedded in one of the soldier’s thighs. Dr. Goldman removes it and examines it. He determines that it is very old. Not the Latin of the textbooks. Casey was speaking the Latin of the Caesars. Perfectly. Fluently. I should add that while many sections of this book were well-enough researched, Sadler gave no heed to the linguistic concerns of this book. “The Caesars” were likely speaking Greek, for one thing. Anyway, based on this evidence, Dr. Goldman jumps to the conclusion that he’s dealing with the immortal Roman soldier who stabbed Jesus Christ in the side. It takes him like ten minutes. At first I was all “this is ridiculous” but you know, it occurs to me that it kind of makes sense within the fiction of the novel. If Casca legit exists and has been walking around for two millennia, the legend is probably a little more solid than the Longinus legend from our own reality. Looking around at the series summary shows that in later books we find out that there are whole factions of people who have emerged to promote or hinder Casca for some reasons, so yeah, I’m willing to give the book a pass on this. Dr. Goldman goes to check on “Casey,” who tells the doctor that he is who he thinks he is, and then reveals his story via some kind of telepathy. Honestly, that was the weirdest part of the book. Nothing anywhere else suggests that Casca has telepathic powers, or even that telepathic powers exist in this story. The story could just as easily have been conveyed by handing the doctor a manuscript or just sitting around and talking for a while. I mentioned that I read the Kindle edition of this book, and I want to bring it up again to say that it had a lot of formatting problems. I think it was yet another OCR hack job with no proofreading. This makes it hard for me to criticize the book in terms of style and grammar, but I’m going to land on the side of dodgy. Oddly, a lot of those problems smooth out as the book progresses, although punctuation and letter switching remain a problem throughout. That can easily be explained by the aforementioned OCR problems, but I don’t know just how much of that blame can be laid on technology and laziness. And yet, while the book was not what anyone would call well-written, it did manage to convey a sense of urgency and excitement that really worked in its favor. I honestly enjoyed large swathes of this novel, but there are some major caveats. Straight up we are transported to Roman Jerusalem, where Casca is stationed as a soldier. We get to see the part we all came for, where Jesus gets crucified and then tells Casca that he will “remain as you are until we meet again” or something like that. Casca doesn’t think anything of it at first, just putting it all down to an already crazy man driven further crazy by pain and exhaustion. Jesus dies and Casca goes about his business. Easily the best part of this book is following Casca through his life as a Roman legionary. Sadler manages to convey an easy fluency with military life that obviously makes a lot of sense considering his own background. What he manages to do, though, is to put it into modern military lingo. Casca has a “Sarge,” for instance. There’s a lot of stuff like that. Sadler also used real Roman military terms to describe things, too, and it doesn’t get overly explanatory or bogged down. It really, honestly works. This is almost blasphemy, but it reminded me a lot of the anachronistic language in The Once and Future King, which ranks among my top three books. I’m not a classicist, but I’ve read some Mary Beard. A decent bit of Sadler’s depiction of Rome checks out okay. He avoids some of the major tropes and pitfalls, although he does refer to a vomitorium as a place to go puke so you can eat some more, so at least one major misconception made it in. One thing I liked is how diverse the Roman military is depicted as having been. Casca runs around with Gauls, Germans, and Syrians, among others I’m sure I’m forgetting. Casca has been diddling his Sarge’s lady, and the issue comes to a head when the Sarge finds out and attacks him. Casca gets stabbed in the gut, but he also kills the Sarge. This is the point when Casca realizes that Jesus wasn’t just talking crazy. The wound heals up overnight. Casca is put on trial for murdering a superior officer, booted from the Legion, and spends the next thirty years underground as a slave in a mine. Another thing I liked: Casca, despite being immortal, still has things to fear. He makes the realization himself, and it’s a chilling thought. He can’t die, but he can still suffer. He still feels hunger and thirst. He still feels pain. Now, one might argue that these sensations take on a different meaning when you know for certain that you can’t die of them, but there are other things to consider. Casca himself considers the fact that if the mine collapses with him in it, he would be trapped in there forever. Or maybe Jesus would come down there and find him so he can die, but that’s cold comfort. So Casca is an immortal, but the story still has stakes. There’s a lot to like about this book. So far that’s all I’ve talked about. Now let’s talk about why this book is godawful. This book features an African man and an Asian man, and neither of them are treated well. The African, Jubala, is a gladiator. After Casca escapes the mines, he is sold to the same gladiator school as Jubala, who is the star. Casca quickly rises in popularity after a series of victories, and Jubala becomes jealous. That part is fine. Jubala is characterized with a degree of racism that can only be described as Weird Tales-ian. Ripped straight from the African tales of Robert E. Howard, this man is referred to as barbarous with primitive and evil gods. He sexually assaults and kills both men and women as sacrifices to his gods. He and Casca finally come to fight in the gladiatorial arena, where Casca defeats him with Kung Fu. Yep. This was almost rad. See, there’s the Asian of the story, Shiu Lao Tze. Casca meets him earlier in the story than the whole Jubala bit, and he’s a different set of stereotypes. He’s the standard wise(cracking) old Asian man, usually referred to as “Little Father” or the like. He probably has a long wispy beard but I don’t think it was mentioned. He’s Chinese, but he’s also pan-Asian. The worries me because Sadler served in, you know, Vietnam. Shiu is treated sympathetically, unlike Jubala. We’re meant to like him. But he’s also a tasteless stereotype. He reminded me a lot of Chiun from The Destroyer, which makes sense considering that they’re being pulled from the same well. On the flip side, he does teach Casca how to use Kung Fu, so we get to see him use it as a gladiator, which, again, is pretty rad. It’s just a shame that this bit of awesomeness is surrounded on all sides by the inexcusable. The story ends with Casca earning his freedom by winning in the arena harder than anyone else. He promptly loses that freedom by getting roaring drunk and insulting Nero in public. He’s assigned as a galley slave on a ship, which sinks after four emperors come and go. He wakes up on a beach and rejoins the army, fights against the Parthians, and goes crazy for a while. He makes a pretty good point when he screams at Jesus for the cruelty of this punishment, stating that his followers say he’s a God of love but he’s doing a good job of proving them wrong. We cut back to Dr. Goldman, who is unsure of what to do with this information he’s been given. I know it’s a sign of my white dude privilege that I enjoyed this book so much, but dammit, I really enjoyed this book. For what it’s worth, I also hated large parts of it. If it could have had less flippant misogyny and sickening racism, it would have been a book that I’d recommend you read. It was not what Pontius Pilate, Procurator of Judea, would call your best quality day. He gave the wounded man one dirty look and dropped back off to sleep, oblivious of the new set of oversexed body lice that had just copulated their way up the long journey from his unwashed feet along the calves of his stringy, hairy legs and into the curly, matted hair of his pubic region, there to join a number of their relatives—including a few diehard fleas who would have rather been on a decent dog. And Casca is basically a decent guy. Even before this book is over he stops looking at war as a glorious thing and instead begins to see it for the atrocity it is. But he’s cursed to be a soldier until Jesus comes back, so he’s going to have to deal with it. Looking through the synopses of this series, there do not appear to be any stories of Casca in, say, 2050. Or 2100. 2525 (if man is still alive). The book wasn’t good by any stretch of the imagination, but it was plenty enjoyable. I’ll probably read later books in the series, mostly to see if they manage to do away with the most offensive parts of this book. And I’m curious to see how later authors do with that. I feel like it could only improve. One of the most notable things is how the book manages to toe the line between glorifying the military and showing it warts and all. This isn’t just the Roman Legion. There’s an odd-as-hell mention of a guy in the frame story who is selling Army medical supplies on the black market. We just learn about it as the point of view flits through his mind for a moment. I mean, it’s clear that the singer of “The Ballad of the Green Berets” is gonna be pretty pro-military, but at the same time, this wasn’t the kind of polished and fawning you’d expect from someone who never served. Sadler probably had a pro-military agenda, but he at least knew what he was talking about. And perhaps we can disconnect a pro-military agenda from a pro-war agenda? I don’t see the latter here. I dunno. Stuff’s complicated, y’all. I remember seeing this when it came out and thinking, “It will be a cold day in Hell when I read anything by Barry Sadler.” Different times, different perspectives. I think you’re worried a little too much about enjoying what you enjoy. I have the same very lefty views, but I manage to enjoy reading Lovecraft and LOVE Robert E. Howard. Yeah, there’s the dodgy bits. Lovecraft seems bad even by the standards of his own day. But I can still enjoy reading his work. If your book pile has room for one more, you might like “Passage at arms” by Glen Cook (or most anything by Glen Cook, he can be an acquired taste, but very addictive). He served in the Navy in ‘Nam and has a love of history (military and otherwise) which tends to flavour his narratives. Passage at Arms is a great starter, because it’s set in his Starfishers universe (but works as a standalone novel as well), and involves space submarines(!). You could also try his other standalone books “A Matter of Time” and “The Dragon Never sleeps” (Though the latter is a large book).